Do you all remember back in December I conducted a Purex Triple Action Detergent Review? Well, my bottle of detergent is almost gone *sad face* and I am ready to go stock up on some more very soon! Anyway, Purex has sent me 3 coupons to giveaway and these coupons are for one full-sized free bottle of Purex Triple Action Detergent! So, that means that three of you now have the opportunity to WIN your very own bottle and see just how great this stuff is! Disclaimer: I received no monetary compensation for this post. As a Purex Insider, I did receive Purex Triple Action Detergent for review purposes. All quotes and stock photos are from the Purex website and email. Prizes are being mailed by myself. All thoughts and opinions are 100% mine. I learned that it's safe for HE washing machines. I'm entering on the rafflecopter under my FB username, Mary Happymommy. Thanks. It's HE washing machine safe! I learned it comes in a free and clear scent. It comes in a clear scent! love the variety of scent - including fragrance free. I learned that it comes in Mountain Breeze scent and free and clear scent! I learned that Purex UltraPacks dissolve quickly once the washer is started – even in cold water. I'm glad to know that it comes in a Free & Clear variety. I learned that you can use it for HE washing machines...YAY! I learned that New Purex Triple Action leverages the best parts of their current formula, combined with new additions, to deliver great cleaning plus improved brightening power. 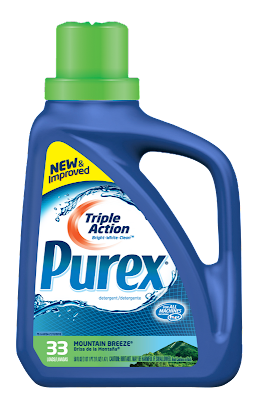 I learned that this new and improved Triple Action formula delivers even better on Purex’s promise to leave your clothes bright, white, and clean, and as always, for half the price of the leading brand! I learned that this dissolves quickly in cold water. I like a detergent that works best in both cold and hot. Purex® has a Laundry Help app for the iPhone®, which includes a Stain Guide, Fabric Care Information, Clothing Label Decoder and a Laundry Timer. Learned that they have 8 different formulas in the liquid detergent. I love that its scent is meant for people who are sensitive to harsh detergents. I learned that's it's safe for septic tanks. I had learned that it is twice as strong to utilize as a smaller bottle. You can use it with an HE washer! I learned that they are cheaper! I learned there are a variety of fragrances. I learned that they dissolve quickly in cold water. Purex was started in 1922 in los angeles. I didn't realize they went back so far. I love that it comes in Free & Clear. I learned that it's safe for HE washers. I learned they also make 20 Mule Team Borax, Zout, and Sta-Flo products. Thanks for the giveaway...Purex Triple Action has been specifically formulated to work in both traditional and High Efficiency (HE) washers.